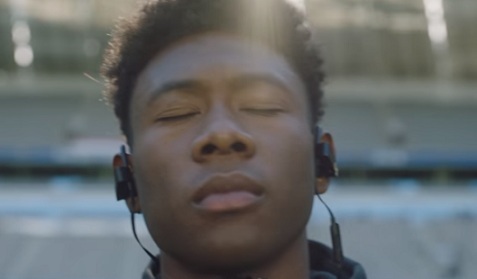 Beats continues its “Be Heard” campaign with a new commercial, starring David Alaba. The 30-second spot features the Austrian professional footballer who plays for German club Bayern Munich and the Austria national team preparing for next season with Powerbeats Wireless earphones in Trophy Gold. Alaba is shown doing his workout, which includes jumping rope, spinning, lifting weights, and more, while listening to music through his wireless Beats. The song used in the ad is the 2016 single “Woes vs. Whoas” by Wills. The Beats Powerbeats Wireless feature Apple W1 technology, which brings seamless setup and switching for your Apple devices, amazing battery life of up to 12 hours and 5-minute Fast Fuel charging. Thanks to their water resistance, these earphones push you further and handle tough training, may it be rain, sweat or shine, and, thanks to their redesigned RemoteTalk, they boast full Siri compatibility, on-cable functionality, and improved button response when changing volume, taking calls, and switching tracks. The Powerbeats Wireless earphones cost $199.95 and come with Eartips with four size options, a carrying case, universal USB charging cable (USB-A to USB Micro-B), Quick Start Guide, and Warranty Card. The brand’s “Be Heard” campaign stars also LeBron James, Kevin Durant, Draymond Green, James Harden, Anthony Joshua, Deshaun Watson, and others.